Upon doing the tests again in bright sunlight with Auto mode, Galaxy S9+ does a fine job of exposing lights correctly the second time around, defaulting to F2.4, which gives you narrower aperture plus the fact that HDR also worked in Auto mode. Most of the shots came out just as good as the Pixel 2 XL and I would now say they both do very well in bright light situations. But my low-light comparison still stands, Pixel 2 XL is still king of low-light in my opinion as F2.4 nor HDR helps the Galaxy S9+ in low light situations. Of course, the most interesting fact came out of this test was that while F2.4 is great for bright light, it is not ideal for all situations. In fact, in situations where the user wanted more bokeh in something like macro shots or shots where background blurring was desired, F2.4 didn’t give you the results like F1.8 on the Pixel 2 XL (or any other smartphone with narrower aperture). What Samsung could improve upon the auto mode was to have an option to select the aperture between F2.4 and F1.5. That way, people can still take advantage of the HDR mode, which is only available in Auto mode. And in my opinion, Samsung might have done better by going with a single F1.5 lens with an ND filter, that way people can get awesome shots in full F1.5 in bright sunlight. As for front portrait mode, I found in general the Pixel 2 XL outperformed the Galaxy S9+ in all situations and S9+ suffered accidental blurring of the background whenever there was less light while Pixel 2X L performs well in all types of brightness. As for back portrait mode, they are both good with different characteristics. Galaxy S9+ dual lens setup used for its live-focus(Portrade Mode) is really built for subject further away and may work great when your subject is further away from you while the Pixel 2 XL Portrait Mode works well in arm-length distances. Knowing these characteristics will allow you to make full use out of them for sure. Overall though, if I had to choose one camera to take still photos in bright light or low light, it would still be the Pixel 2 XL. Most smartphone cameras do very well in bright light but all have trouble in low-light and that is where Pixel 2 XL shines. But if you aren’t too big into photography, I think Galaxy S9+ or Pixel 2 XL should do just fine. 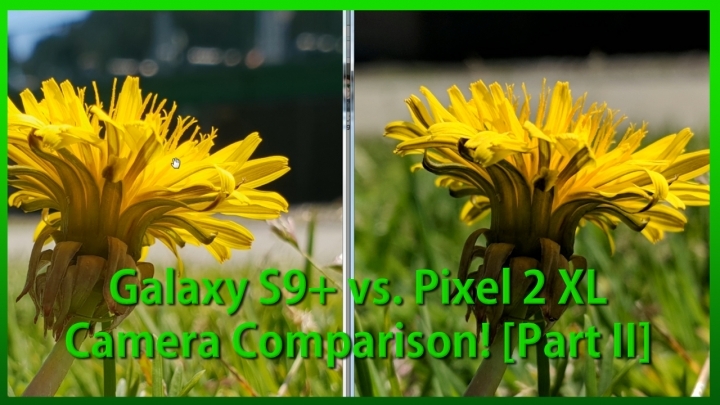 Next story Galaxy S9+ vs. Pixel 2 XL Low-Light 4K Video Comparison!